When church is at its best it is a place of authentic community for everyone; a place where people can grow and thrive as they experience belonging and connection in Jesus’ family and mission. Without a family of their own do they find a true experience of family among us? Where is the place for the not-yet-married, the widow, the divorced or the never married? What are their unique needs and how do we address them? What unique gifts do Singles bring to our churches and how do we maximise them? ‘What We Cannot Be Alone’ is not a book for Singles; it’s a book for the entire church. 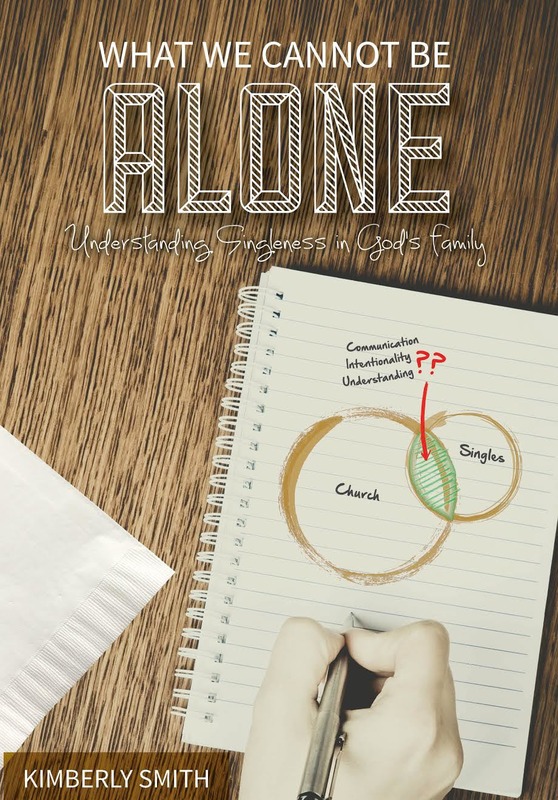 From many years of ministry and personal experience Kimberly leads us in a frank and open dialogue that addresses the real challenges, considerations and blessings of singleness and the role we play in being to Singles what they cannot be alone. I would like to order your book but not through PAYPAL. I live in Western Australia. Do you accept VISA please? I don’t accept visa but you could do a direct bank transfer? Send me an email at kimberlyrsmithministry@gmail.com and I’ll forward you my bank details. I ordered this book back on 2nd August and haven’t received anything yet. Not even any correspondence. PayPal has processed it so I emailed the email address linked to the payment via PayPal. That person said she knows nothing about it. Maybe PayPal has the wrong address. I don’t know. Could you check somehow? Your payment has definitely need received and I believe a book was sent to you but if it hadn’t arrived yet something has clearly gone wrong. Will ship another one out to you ASAP. I’ll let you know when it’s in the mail and maybe you can let me know when it gets to you? Sorry again, thanks for checking on it!! That would be great Kim. Perhaps you may want to check the email listed on your paypal account too as the Kim I emailed had no idea what I was talking about. Do let me know when it’s in the mail. Thank you. The email linked to my PayPal is kimstent@gmail.com. I did receive your payment and notification of it etc – so I’m not sure which email you’re referring to? Is there a setting somewhere that I’m not seeing? Oh good. It’s not here yet but tomorrow is another postal day. (Though AusPost seems to have slowed down.) When I ordered your book, paypal immediately sent me an email to notify me of the transaction. On that was the one I emailed: kimberlyrsmith@…..
Ahh. Ok. Will look into that. It arrived today!! I’m excited to read it. I’m a long term single and, like you, have hopes for married being in God’s plans for me but whether it is or not I want my life to be about Him. Plus we have freshly felt reminding that we need to learn to be family at my church so I’m anticipating God’s voice/promptings in this reading. I look forward to hearing the things that happen through this conversation, Kelly. Keep me posted. Hi, would I beable to purchase a book from you Kimberly?